The size and type of shipping container you buy or hire depends on a variety of options – from purpose to the amount of space available. Choosing the right container for the job you have in mind is important – follow the quick guide line below or click through to the corresponding pages to read more on each individual type or size. When shipping containers are manufactured, they are made with COR-TEN®, a type of corrosion resistant alloy steel made by US Steel. It has become the standard used to manufacture shipping containers all over the world. This is the most common type of container, used for dry storage of items that aren’t adversely affected by changes in temperature. They are available in two heights, with standard height being about 2.6 meters, and a ‘high cube’ container being about 2.9 meters. 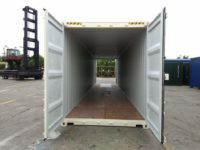 These containers are available in different lengths, as follows: 4 meters (8ft), 3 meters (10ft), 6 meters (20ft), 9 meters (30ft), and 12 meters (40ft). Also known as a tunnel container, this shipping container has doors on both ends, allowing for easy, quick loading and unloading. 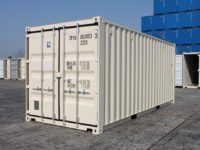 Like the Open Top Container, they are available in 6 meter (20ft) and 12 meter lengths (40ft), with 2.6 meter (8ft 6in) or 2.9 meter (9ft 6in) height. 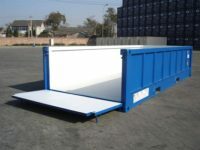 This type of container has a removable tarpaulin top for top-loading of cargo and shipment of over-height cargo. 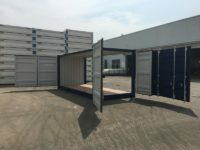 These containers also come in both standard height at 2.6 meters (8fr 6in), and ‘high cube’ height at about 2.9 meters (9fr 6in) tall. They are available in 6 meter (20ft) and 12 meter (40ft) lengths. This container type is also available with a solid steel top. These containers open from either one side, or both sides, as well as one end, again making it easy to load and unload materials such as bundled lumber. They are available in 6 meter (20ft) and 12 meter (40ft) lengths, with both 2.6 meter (8ft 6in) and 2.9 meter (9ft 6in) height. These containers have either fixed OR collapsible sides, allowing them to be folded and stacked when not in use. 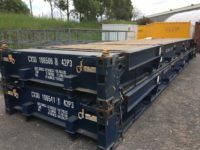 These are used for shipping heavy, over-width and over-height items such as machinery, and are available in 6 meter (20ft) or 12 meter (40ft) lengths. They are built with a strong platform to support the heavy loads they carry. 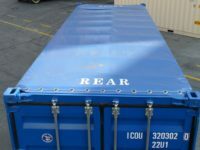 Also known as Reefers, these containers are designed specifically for transportation of refrigerated or frozen food products, and are available in 6 meter (20ft) and 12 meter (40ft) lengths. These units are well-insulated and maintain a constant temperature from shipper to destination, usually using 1 or 3 phase power. A decommissioned refrigerated container that does not have operational hardware, insulated (also known as thermal containers) can still keep items cooler. 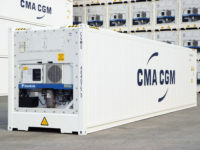 They are available in the same heights as the reefers, with standard height being about 2.6 meters, and a ‘high cube’ container being about 2.9 meters. 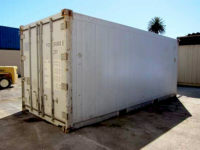 These containers are available in different lengths, usually: 6 meters (20ft) or 12 meters (40ft). 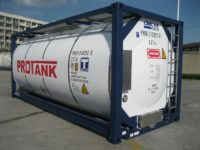 These containers are built with tanks mounted in frames, and are designed to transport liquid products. They are generally treated with anti-corrosive materials both on the outside and inside to protect them. The tank component may be made from a heavy duty plastic or metal. Plastic tanks have to meet the rigorous standards required for shipment on ocean going vessel. Available in 6 meter (20ft) lengths. Used mostly for the transportation of bulk materials, such as coal, gravel, and other materials. 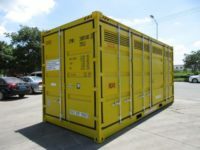 These containers are usually made from steel and are built for rugged use, and in 6 meter (20ft) lengths. They’re also available with a hard or soft open top. A Dangerous Goods or Hazardous Goods container is specifically designed for transporting any sort of material or liquid that has been classified as a poisonous or dangerous chemical. Available in 2.9 meter height and 3 meter (10ft) or 6 meter (20ft) length – and the 6m (20ft) length can also come with a side opening door. This container type is designed specifically for transporting cars. They have the associated equipment for safely loading and securing cars. Available in 2.9 meter height and 12 meter (40ft) length.